Capitol Reef, now a National Park, takes its name from one of the local peaks which the early pioneers named Capitol due to its shape reminding them of the capitol building in Washington D.C. “Reef” was the description given to the mountainous terrain by people with seafaring pasts or ancestors and has nothing to do with the area having ever been a reef beneath the sea although at times over the eons it has been under water. 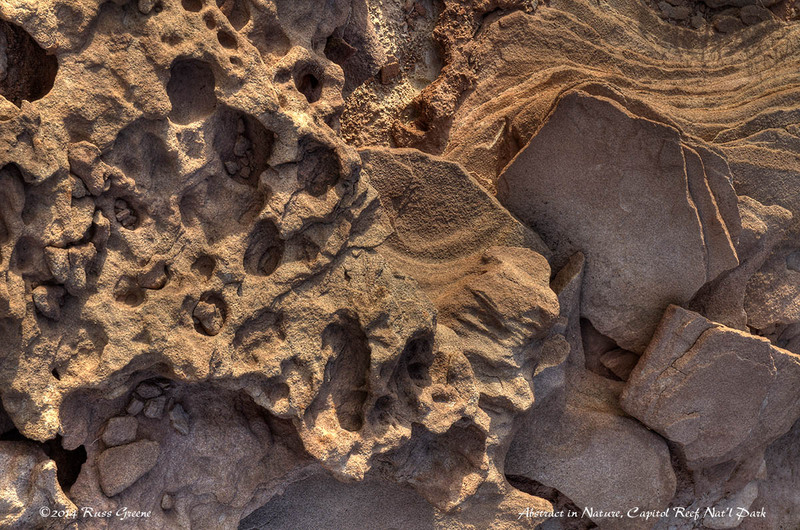 Created 65 million years ago, a warping in the earth’s crust which extends across south-central Utah, and later created the Colorado Plateau, uplifted many layers of sedimentary rock. These layers had formed from sediments deposited over hundreds of millions of years as the environment changed from seas, to deserts, tidal flats and other environments. 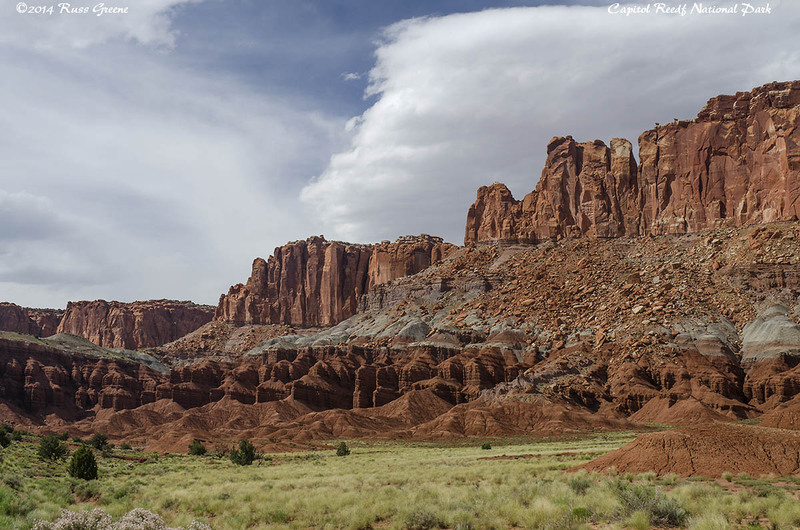 Since the great uplifting, many layers have eroded away leaving what we see today, the stunningly beautiful landscape that is Capitol Reef. One of the great geological mysteries and subjects of hot debate is where all the lava boulders came from that are found in certain places of the park. There are no volcanoes in the area. Were they washed here from distant places in great floods? Were there cracks in the earth’s crust that allowed lava to seep through in the absence of volcanoes? 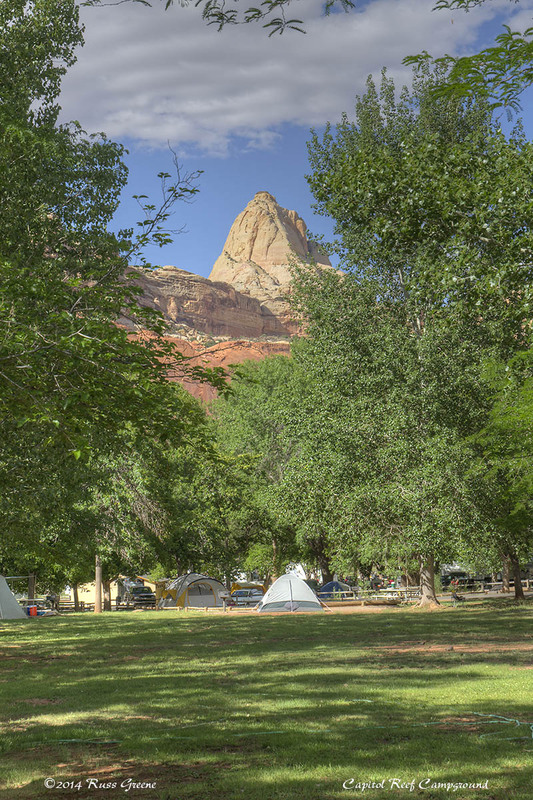 Early occupants of the area included the Fremont Anasazi, and more recently the Mormon pioneers who settled here and planted the fruit orchards in the 1880s by which today’s visitors to the campground find themselves surrounded. Fruit picking, by the way, when the fruit is in season, is allowed on the basis of all you can eat for free, but anything you wish to take with you when you leave must be purchased. The orchards include: apple, peach, cherry, pear and apricot. I hear there are some nuts too, I mean nut trees, not crazy people. 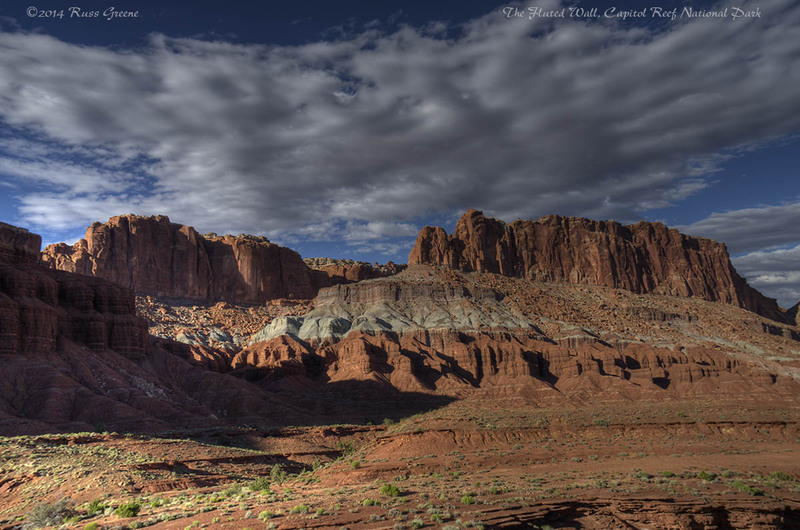 Much of Capitol Reef can be seen for free while driving highway 24 which bisects the park from east to west. Likewise, the visitor center and campground are accessible without an entry fee although if you wish to camp at the campground a fee is charged. In fact, the only time you are asked to pay a park entry fee, $5 for cars (free with an interagency pass), is at a self-pay fee station should you wish to drive the 10 mile scenic drive (highly recommended) which begins after passing the campground. Fees and reservation info here. Route 24 and the scenic drive are the only paved roads in the park which are shown on the park map and the lack of paved roads may be one reason the park is less known and less visited than some others. From the park’s web site: “Located in south-central Utah in the heart of red rock country, Capitol Reef National Park is a hidden treasure filled with cliffs, canyons, domes and bridges in the Waterpocket Fold, a geologic monocline (a wrinkle on the earth) extending almost 100 miles.” This is a very special place, IMHO, and I couldn’t force myself to leave for a week. Just driving through along 24 is a visually rich experience with a multitude of jaw-droppingly beautiful scenes. The campground, as I wrote above, is a lovely little oasis in the desert. It has 3 loops and at least some sites capable of accommodating the largest RVs. Sites are levelish asphalt pads with grassy surroundings but may require some leveling. Picnic tables and BBQ grills are provided as well as restrooms with flush toilets. There are no showers, nor RV hookups but there is an RV dump station. 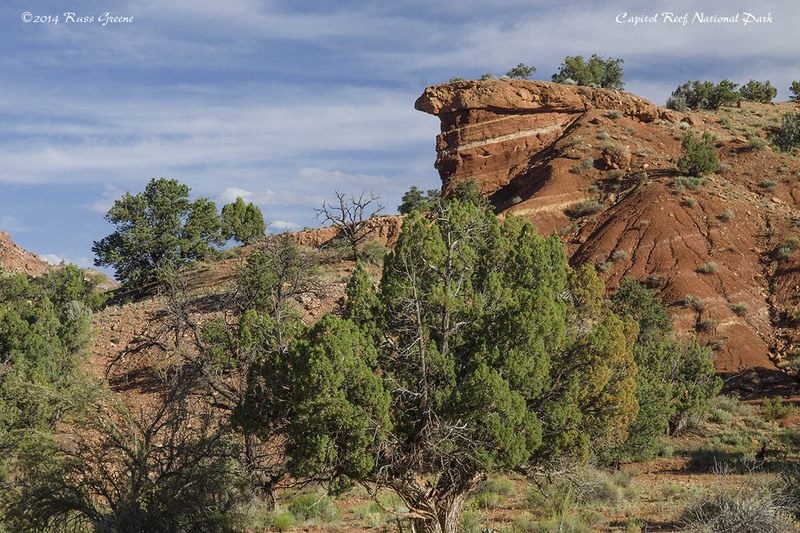 There’s lots of shade from the lovely conttonwood trees which is good because it can, and does, get hot in Capitol Reef. It’s only $10 a night for a campsite or $5 with an interagency pass. A few steps from the campground is the delightfully lush green picnic area. There is generally little if any cell service in the park although you may get some on various hilltops such as Panorama Point, a few miles west from the visitor center. I’m told things are better in Torrey to the west and Hanksville to the east although when I passed through Hanksville I couldn’t get AT&T and maybe not Verizon either. 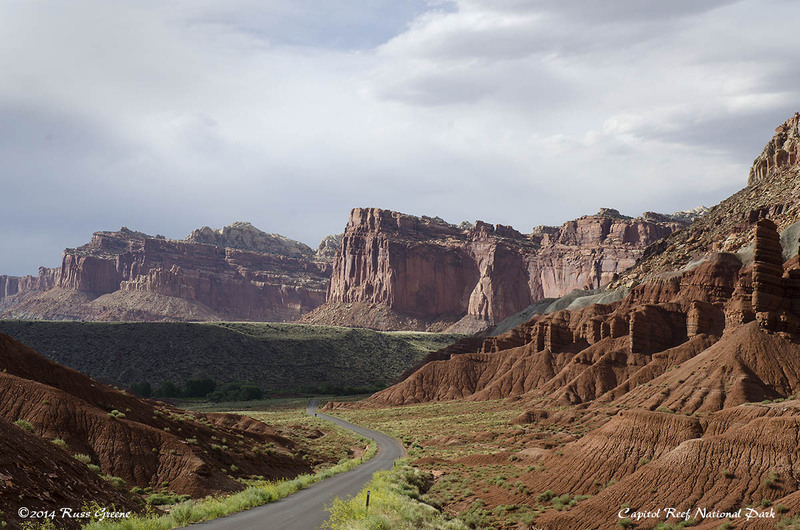 In my estimation Capitol Reef if one of the most beautiful places a person is ever likely to visit and for that reason alone it’s well worth a visit. 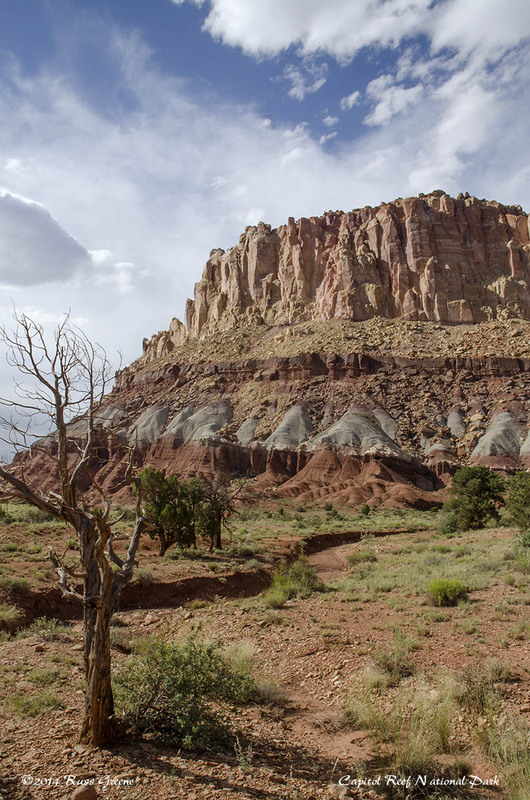 I think Capitol Reef would have to be my favorite destination of all I’ve been to on this trip, maybe all I’ve been to period… if I had to pick one. There are so many spectacular things and places.